The Tampa Bay Rays placed Carlos Gomez on the 10-day disabled list with a strained right groin before Wednesday’s series finale In Kansas City. Christian Arroyo has been called up to take his place on the roster. Meanwhile, Matt Duffy (right hamstring tightness), who also left Tuesday night’s game, although it was not serious enough to warrant a trip to the DL, and he could return to action as early as Friday against the Angels in Anaheim. Arroyo, the prize in the deal that sent Evan Longoria to San Francisco last December, has yet to make his Rays debut. He is currently is ranked as the club’s number six prospect by MLB Pipeline, as well as baseball’s number 80 overall prospect and the number four third-base prospect. The infielder was the 25th overall selection in the 2013, and made his Major League debut with the Giants last season, playing in 34 games and slashing .192 BA/.244 OBP/.304 SLG/.549 OPS with 3 HR over 135 plate appearances. Following Spring Training, he was optioned to Triple-A Durham, where he is hitting .200 with a homer and eight RBI in 17 games. Well we’ve got some (left-handed starters) coming into play in Anaheim, manager Kevin Cash said. He’ll get some opportunities. He’s played mostly third base. But he’s versatile in the fact he can play short, second and third. We saw all of that in Spring Training. And especially with Matt nursing a little bit of a hamstring. I’m not quite sure when he’s going to be available, but we’re hoping it’s just going to be a couple of days. As for Duffy, the infielder told reporters that his hamstring had improved from Tuesday night, which encouraged him about his chances for a quick return to the lineup. I think it feels about like it did after I strained it (earlier in the season) and took three days off, Duffy said. And the last time we took four days off before we started ramping things up, so maybe a day or two here. It’s not quite perfect, which is why I’m not in the lineup, but it’s not far off. … Running the bases is the main concern. You get to the point where you’re torn between either hurting the team by not being able to run hard, or hurting yourself because you do run hard. I think we’re probably going to play it a little safe. If I need one extra day, first day in Anaheim, I don’t think that’s out of question to take two days off and then go from there. Duffy has been one of the Rays’ most productive players at the plate. He’s hitting .322 with two home runs and 14 RBI. Gomez left Tuesday night’s win over the Royals due to the groin injury. The 32-year-old outfielder is batting .200 with five home runs, 11 RBI (and the worst walk rate of his career) over 37 games. Obviously, the way he plays, how intense he is running the bases, playing the outfield, probably the smart (move was) to get him off his feet for 10 days and not allow him to aggravate it, Cash said. It will be a loss. I know Carlos hasn’t swung the bat the way he’s capable of, but you know eventually he’s going to get hot. We’re still waiting, but maybe this will give him a little bit of a blow, rest his mind as much as his groin, and come back and get us going once he does come back. The Tampa Bay Rays fell to 6-6 on the Grapefruit League season Tuesday afternoon with a 9-1 loss to the Boston Red Sox. However, there were a few highlights from the day of play. Similar to last spring, Jake Bauers hit a moonshot to right-field — a blast that cleared the boardwalk and landed on the roof of the team office building. Before Bauers made his way to the plate in the second inning, team ace Chris Archer yelled to him, “Show me something.” The rest, as they say, is history. (This) one definitely went further, definitely was better contact, said Bauers. And that’s all I’ve got. So don’t expect anything more than that … You almost black out a little bit. You don’t feel it off the bat. Then you have to remember where you’re at and you have to get around the bases. Though Bauers will likely start the season in Triple-A, he is bound and determined to make it a difficult decision for Kevin Cash. He’s still really young. … The swing is there, it’s been there, he’s worked really hard on that, Cash said. Now he’s going to find out what he’s capable of doing by generating more power. He’ll hit his share of home runs. Jake Faria and Carlos Gomez both appeared in a simulated game on Tuesday. Faria worked three innings intent on improving what he calls a “painstakingly” slow tempo. Faria conceded that he had similar issues in the minor leagues, and made a point to walk up the mound as soon as he got the ball back. I felt like it was a lot better, Faria said. It’s mainly about being comfortable with it so that when you do get in an actual game it’s second nature. Gomez got one last tuneup before his debut against the Orioles on Tuesday. Welcome back Duffy and Hech … but where the hell is Miller? Both Matt Duffy and Adeiny Hechavarria bounced back from a pair of minor injuries, and showed well in the process. Hechavarria — who missed a week because of tightness behind his right knee after he slipped while taking ground balls in sneakers rather than cleats last week — went 3-3. A little lesson learned, he said through an interpreter. It shouldn’t have happened. Duffy, recovered from his stiff back, and went 1-2 at the plate. He also made several good plays at third base. It’s one of those things I’ve dealt with in the past, and sometimes I’ll have to take a couple days off like this time, said Duffy. But with Spring Training, it’s probably smarter to extend it and be safe, and be done with it. Meanwhile, Brad Miller hasn’t appeared in a game since the February 23, concerned that running with a broken right toe could both complicate his surgically repaired core muscle, and inflame his hip which he has had issues with in the past. Per Marc Topkin (Tampa Bay Times) Miller took a handful of at-bats in the simulated game, but something didn’t seem right and he won’t play as hoped Wednesday. He felt fine, Cash said. We’re going to sit down and talk. He didn’t go 100 percent. So we want to get a read on how he comes in (Wednesday) and reassess where we’re at. Left-hander Blake Snell will get the start for the Rays on Wednesday against Baltimore, while Mike Wright will toe the rubber for the Orioles. Other hurlers to see mound time are TBA. — The Rays skipper said they will carry several relievers capable of working multiple innings, which makes sense given the plan to open the season with a four-man rotation. Call the calvary, reinforcements are on the way. 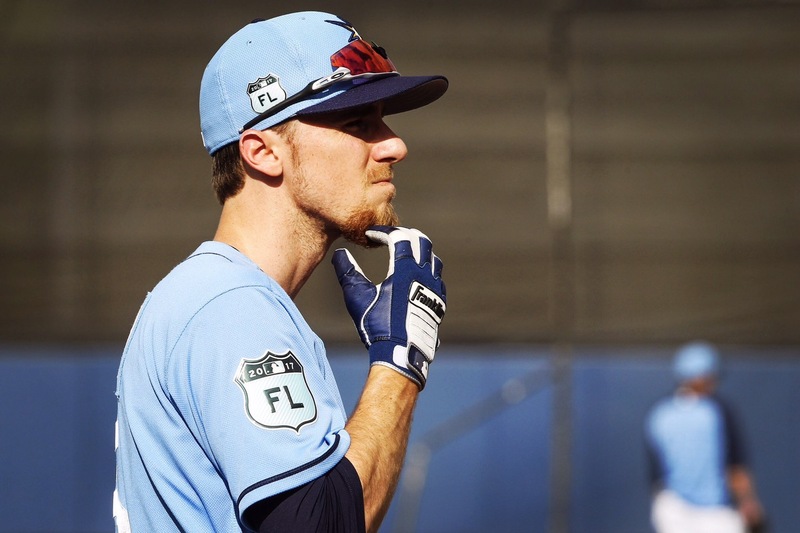 Tampa Bay Rays shortstop Matt Duffy is slated to begin an injury rehab assignment on Tuesday with the Class-A Charlotte Stone Crabs — the final link to his return to the big leagues. Duffy, who has yet to play this season — Spring Training or otherwise — is rehabbing from September surgery on his left heel/Achilles tendon. He has dealt with heel problems on and off for several years, and he told local reporters that he’s eager to play pain free baseball. Yes. Definitely. Definitely. It would be good to be on the field in a game. That’s for sure. We’re excited to get him out there, play four, five innings, two at-bats, kind of run the spring training process with him a little bit. I know he’s been working really hard here. You could probably make the argument that he’s done enough stuff here as far as getting his body in shape, but there is something to be said for getting on the field, standing out there for four, five, six innings, whatever it is, and we’ll do the gradual build up. Duffy believes the rehab will take approximately two weeks. I think that’s kind of the tentative plan. As with anything, it always depends on how I’m feeling day to day. So add or subtract several days if need be. I’m really happy about the way (his recent workouts, including Monday’s, have gone). The Rays skipper noted that schedule has yet to be finalized, although it’s possible that Duffy could spend his entire rehab with Charlotte. I don’t have an exact schedule. Look, we’re excited for him to go out there and play four or five innings, get a few at-bats. Kind of run the Spring Training process with him a little bit. …Right now, Port Charlotte looks like a fairly favorable schedule. I know they play some games in Clearwater, and then they go to Port Charlotte. Tampa Bay acquired Duffy in a four-player trade with San Francisco, that sent Matt Moore to the Giants last season. Duffy took over as the starting shortstop and did not make an error in 18 games (55 chances in 153 innings) at the position. He also accrued an 8.8 FRAA and hit .276 with a home run and seven RBI before undergoing the knife in Charlotte, N.C. The Rays will have to answer a tough question when Duffy returns from the DL, whose spot on the active roster will he fill? Despite becoming the everyday shortstop, Tim Beckham is expected to lose the job to Duffy. Tampa Bay will have to decide between Beckham, who is out of options, or Daniel Robertson, who has been fantastic in the utility role, which is the better option to serve as bench depth. Adam Sanford (DRaysBay) also opined that there is the outside possibility the Rays could let go of Peter Bourjos in order to keep both infielders on the roster. With just 11 days left until the start of the 2017 season, the Tampa Bay Rays are seeking answers on the slow recovery of shortstop Matt Duffy. As it stands, it does not appear that Duffy will be ready by April 2, leaving Tim Beckham to slot in as the Opening Day shortstop. Duffy, who was acquired from the San Francisco Giants in the Matt Moore trade, underwent heel surgery on September 9 with the expectation he would be ready for Opening Day. However, the progress has been slow and he has been limited to drills and strengthening exercises on his left heel. Per Marc Topkin (Tampa Bay Times), Duffy will be sidelined into April. The shortstop told Bill Chastain (MLB.com) that he’s gained strength in his heel, and he’s doing countless baseball activities. He, however, has not done any running yet, nor has he fielded ground balls in game conditions. The next big step for Duffy will come when he runs for the first time, although the timetable for that particular activity is uncertain. Rays manager Kevin Cash said Duffy could go to Charlotte to see Dr. Bob Anderson, the orthopedist who performed the surgery. Cash all but counted Duffy out for Opening Day, and potentially for much of April. I hope in the next few days we get a little more clarity, Cash said Tuesday. I know we’re talking to doctors and stuff like that trying to get a sense. I think we’re to the point now that some of these issues might not even be from the actual surgery, and I’m saying that in a good way. Maybe we get him checked out and it’s something we can do something different with and treat a little differently. INF Daniel Robertson — who’s looked better at the plate, and in the field, since the start of Spring Training — could make the team as a utility infielder, behind Beckham, given their newfound need for a right-handed bat. Per Topkin, that depends on whether the Rays add a right-handed hitting outfielder. Robertson would also be competing against Michael McKenry or Nick Franklin for a spot on the Opening Day roster. I’m happy to be out there playing, having fun, feeling relaxed, Robertson told the Tampa Bay Times. I’m really free of mind right not, letting the game come to me. A couple of key players, Matt Duffy and Brad Boxberger, are dealing with a pair of minor setbacks which have kept them from any Grapefruit League action. There is now a possibility that Duffy — who is mending from left heel surgery — will miss Opening Day due to the slower pace of his rehabilitation. While there has been no major setback, Duffy conceded that he had to back off from taking ground balls at full speed due to soreness afterward. Because of it, he won’t be ready to play in exhibition games at least until the fourth week of March, and noted that he may not be ready Opening Day. It hasn’t quite progressed as quickly as we hoped, he said. The goal is to be smart about it and let it be ready when it’s ready. …We’re trying not to put a hard date on it and just let the thing take its course. If I have to take an extra week then so be it. They’ve been pretty good in communicating that to me – not pushing it unnecessarily. The goal is to be healthy throughout the whole year – not to push it for opening day and then two weeks in I’ve got to go on the DL because it’s just so sore. That’s kind of the goal. Duffy told Marc Topkin (Tampa Bay Times) his heel is “still a little bit behind strength-wise,” which is why they cut out the “more intense” ground balls as he was sore afterward and had to reduce his workload. The focus now is to strengthen his heel, which Duffy said it has been responding well. A caveat: neither he, nor the team, will know anything for sure until he starts fielding grounders again. As for Boxberger, who is one of three players that has not appeared in a Grapefruit League game, his slow track is the result of back/right lat soreness. While there is no concern of an arm issue — therefore he should be ready for Opening Day — the lat muscle is responsible for extension and adduction (the up and down motion of the arms) which affects his pitching motion. I’ve been throwing bullpens and live batting practice and am just a little more sore than I would like to be coming off those, Boxberger said. No concern at all. Just taking it slow right now. Rays manager Kevin Cash said Boxberger likely will not make his spring debut for another week or so, although, he isn’t overly concerned. (Boxberger) had a little bit of a setback with his lat. We’re not overly concerned. It grabbed him playing catch a little bit. We’re going to take it slow, slow with him.